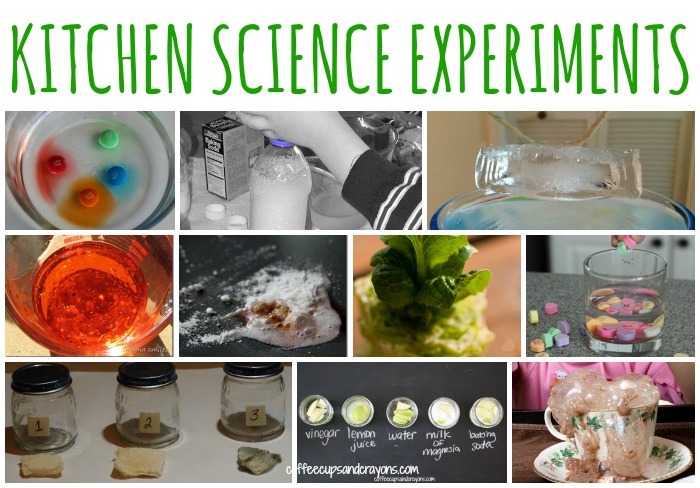 Cool science experiments for kids don’t have to be complicated–there are so many fun ones you can do with the items in your kitchen. Kitchen science experiments may be easy to set up, but they are also jam-packed full of learning. Try one today! Go through your cupboards to test what will dissolve. 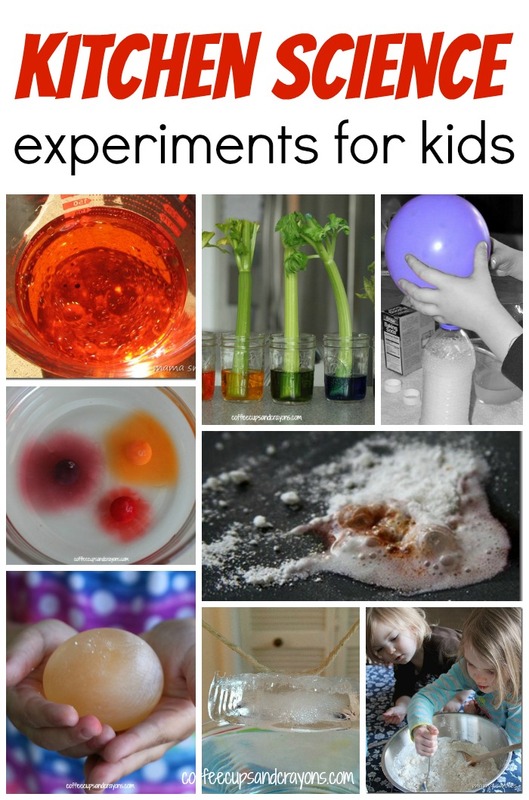 Blow up a balloon with chemistry using ingredients in your pantry. Make a rubber egg with vinegar. Learn about density by layering liquids you have in your kitchen. Use a common vegetable to test for acids and bases. Learn about transpiration in plants with celery and colored water. Grow new veggies with vegetable scraps. See what happens to apples when combined with acids and bases from the kitchen. Metabolize yeast while making pizza dough. Dissolve the M off an M&M. Turn salt into a “glue” for an ice cube. Explore how water and oil react while making play dough. Test for starches in common foods with iodine. Use the ends of romaine to grow more lettuce. Dissolve Skittles to see what happens. I’ll give you a hint, it’s very pretty. Turn hot chocolate into a foaming surprise with a couple secret ingredients. Learn about how germs grow with a simple bread experiment. Experiment with conversation hearts candies to see what will react. When kids become kitchen scientists great things happen. Not only are they learning about science they are also developing thinking skills and gaining confidence as learners. Total win!